A cozy coffee for the early days of Autumn. 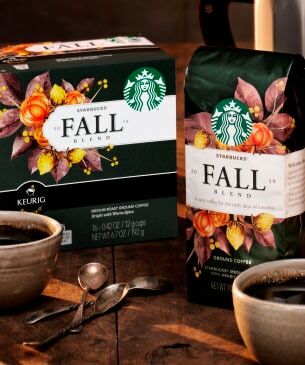 Welcome the season with a harvest of flavors. Layered and full-bodied, this three-region blend offers the best of all worlds. Sumatran beans lend the warmth of fresh spice notes while coffees from Kenya add citrusy brightness, and beans from Peru provide balance and a subtle nuttiness. This is the first time our master blenders have brought these flavors together, creating a cup that¹s hearty yet refined-- a perfect segue to the brisk days ahead. Available as ground coffee and K-Cup® Packs where you buy groceries.